That brand is Merrick Pet Care, and we have been fans of theirs for many years. In fact, every single one of the Lapdogs have enjoyed their food and treats, as well as the many fosters we've had in our home over the years. Merrick's canned recipes have been a staple in our house for over 12 years. The Lapdogs love their delicious recipes, and I love that they are nutritious, made in the USA, and something I feel great about feeding to my dogs. They went above and beyond to support K9s For Warriors, a non-profit who's mission is to train shelter dogs to become service dogs for military veterans with post-traumatic stress disability (PTSD), among other things. 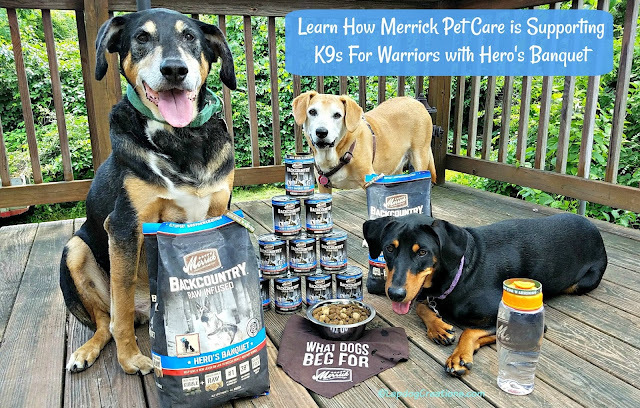 Merrick Pet Care has been the exclusive dog food partner of K9s For Warriors since 2015, providing all of the meals and training treats for each K9s For Warriors service dog as they train to empower their Warriors to return to civilian life. 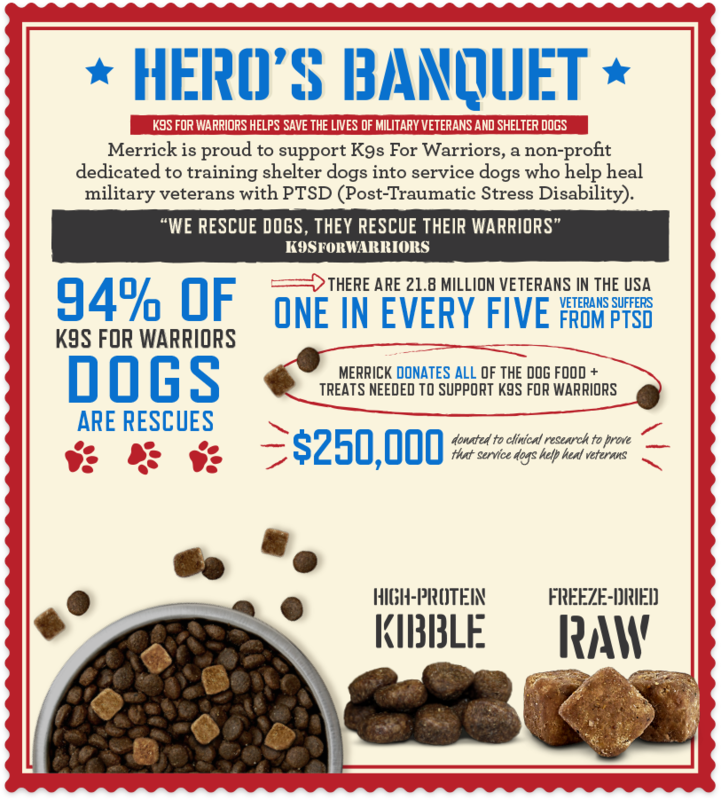 Earlier this year, Merrick expanded their partnership with K9s For Warriors with the launch of Merrick Backcountry Hero’s Banquet recipes. 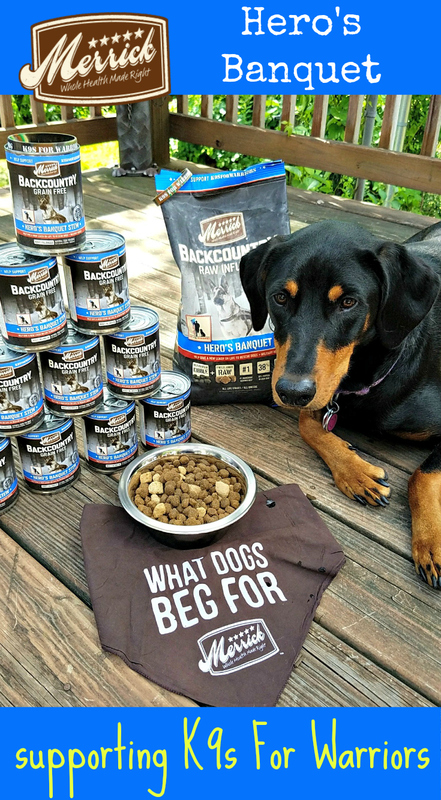 This new lineup of dry kibble, canned food, and treats gives pet parents a way to support K9s For Warriors while feeding a nutritious, ancestral canine diet to their dogs. Hero's Banquet dry kibble is made for all life stages, has an industry-leading crude protein level of 38%, and features freeze-dried raw protein pieces mixed into the kibble. These freeze-dried pieces provide a nutritional boost, as well as a fresh taste that dogs love. The first five ingredients are: Deboned Beef, Pork Meal, Turkey Meal, Peas and Sweet Potatoes. The Hero's Banquet wet recipe is made for adult dogs, and is a great compliment to the dry kibble. It also makes a very tasty meal or topper on it's own. The first five ingredients sound like a great slow-cooked stew to me: Deboned Beef, Beef Broth, Turkey Broth, Green Beans and Carrots. I love that you can actually see the chunks of green beans and carrots in the can... the Lapdogs love the tasty gravy and big chunks of meat. The Lapdogs all loved both recipes, which are grain free and made in the USA. In fact, they loved them so much that we have to give Hero's Banquet our all paws up rating! As mentioned above, K9s For Warriors provides service canines to our military veterans suffering from PTSD, traumatic brain injury, and/or military sexual trauma as a result of military service post-9/11. Their goal is to empower these veterans to return to civilian life with dignity and independence. For a first hand look at the amazing things they are doing, click here to meet U.S. Army Veteran McLean Raybon and his service dog Merrick (yes, named after Merrick Pet Care). 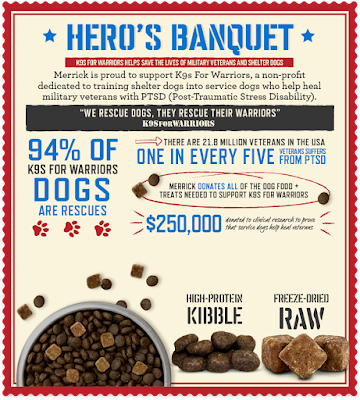 You can also read more about Merrick's partnership with K9s For Warriors by clicking here, and learn how you can donate to K9s For Warriors here. 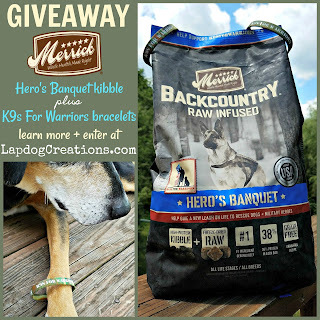 Thanks to our friends at Merrick, TEN (10) lucky winners will each receive a voucher for one 4lb bag of Merrick Hero's Banquet kibble, plus two K9s for Warriors bracelets! I do not currently feed my three dogs Merrick Pet Care foods. However, all three would love to try some! I do feed my pup Merrick! He has a sensitive stomach, but loves their regular beef food! My dog is not currently eating Merrick, but she has in the past! She loved it! I have fed Merrick before, but my animals arent currently on it. They do like it tho! I don't currently feed them this but I am sure they'd like to try it. no, but i won a bag a few months ago and donated it to the local pet food bank. it is very good food. i read the ingredients. Pawesome program! Great job Merrick!! My dogs aren't on Merrick currently but it sounds like a great dog food. WE dont have any pets yet but I will for sure check this out when we do! So my answer may be different then haha! This is great!! Merrick is an amazing company and I applaud all of their efforts with this new food!!! I'm sure Patches will love it!!! We saw this yesterday but didn't want to be first because they never win. You introduced us to Merrick and we love it. This sounds wonderful. We have met a couple of veterans with their digs and it's a great program. I absolutely love Merrick! Whoever wins this is a lucky person! THis is really awesome! Merrick is a fabulous brand and they just got, even more, fab doing this! It's important to support our military and sometimes we forget about those K-9's who work hard for us! We do not currently feed our dog Merrick. No, i have not yet introduced this to her. It's great that your dogs ended up liking both of the Merrick foods! Their recipes sound like they're very high-quality! No. I have never heard of this brand until now! I am so glad I came across your blog post! I do not currently feed Merrick to my dog. No, I don't currently feed my dogs Merrick products, but they do sound great. 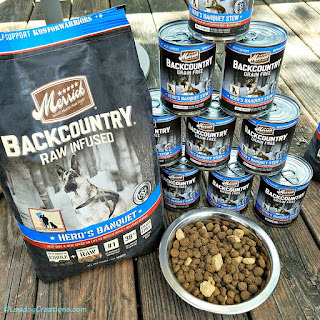 No, I don't currently feed my dogs Merrick products, but they do sound great! I haven't heard of this brand before. It sounds like it has great ingredients. Thanks for hosting a giveaway! The first five ingredients sound just right, we were just talking about the first ingredients with a vet yesterday. I love a cause that supports the military. 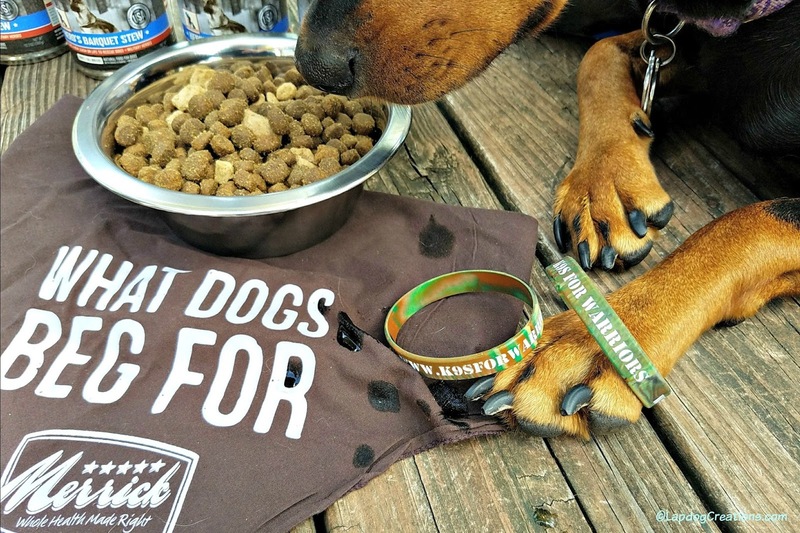 I'm sure all the dogs would love Merrick foods! It's great to know that they are giving back and supporting K9s For Warriors. I've never heard of this brand of dog food before. It looks like it has some excellent ingredients to feed your pup. Thanks for hosting a giveaway! No I just recently started feeding my dogs Blue Diamond because they have become picky eaters. What a delicious food option for our pups! I'm sure Makena would love this. What a delicious food! Makena would love this. 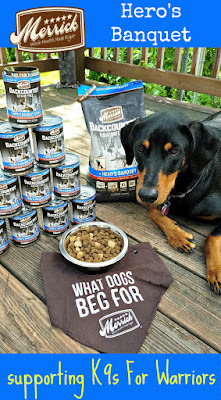 This sounds like the perfect dog food and what a great initiative! My pooches love this food! I don't, but my pup would love to try this brand.